Spring is finally arrived in full force this week, we were supposed to have storms and rain and instead we have had some really great weather! It’s been a little windy, but it sure beats snow and cold weather! !All of our tulips are coming up, and the grass is ready to be cut…..sigh……there were times this winter when I didn’t think we were ever going to see warm weather again, or the sun! I have been off all week, but its been a busy week, with the builders in and out and me trying to get anything done, its been almost more hectic than going to work……well lets not get crazy, its still better than going to work! I had such grand plans to get so much done, and instead I’ve been back and forth with the builders, and still trying to figure out what to do about a stove. What I did figure out is that I need more time to figure it out! This is a big decision for me, anytime I’m paying more for a stove than I did for my first brand new car, there needs to be more thought going into the process. Now if any stove manufacturers are reading my blog, like Wolf, Capital, Blue Star, Bertazzoni, Bosch, DCS or any of the other wonderful folks that make professional grade home stoves, Chef Dennis will be happy to place your ad on his page and gratefully mention your company all the time, if we could work out a deal!! I’m even willing to pay for the stove, lets just be reasonable people~! Now that aside, lets get to why everyone is really here today, its Guest Post Friday, my favorite day of the week!!! Today its my great pleasure to introduce to you Felice from All That’s Left Are The Crumbs, and I have to say there could not be a more appropriate name for her blog, even though I can’t imagine even crumbs being left over from any of those delicious baked goods she tempts us with! Felice is just one of those bloggers you instantly like, her warmth shows through her posts as her writing draws you in and then she keeps you coming back for more with her incredible creations! Felice was kind enough to send me her post before heading to Australia last week and I have been drooling over the images ever since. I know your going to absolutely love this post, but I do have to warn you, eat something before you go any further……….this post might just be too much to handle on an empty stomach!! So sit back, relax, put your feet up and prepare to get hungry as I give you Felice and……..
Aloha to all of the readers of More Than A Mount Full, I am Felice from All That’s Left Are The Crumbs, and I am thrilled to be doing my first-ever guest blog post. It is hard to describe the warm feeling that flowed through me when I was asked by Chef Dennis if I would like to do a guest post on his wonderful blog. Not only is Chef Dennis one of the most knowledgeable people around when it comes to cooking, blogging, and Foodbuzz, but he is such a generous person with his knowledge. All of this made it very easy to immediately say yes to his request. In some respects I felt as if I was going to my first dance – you try on so many different outfits, discarding them all before you go back to the first one that you had tried on. I did the same thing when trying to decide upon a recipe I wanted to share with everyone, and ended up deciding to go with what I know – baking a cheesecake. I first became interested in baking cheesecakes when I moved to Toronto, Canada. 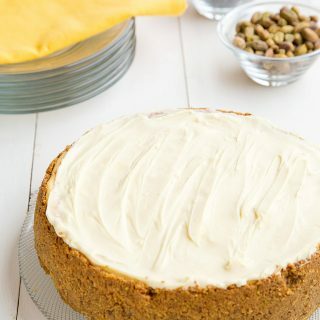 I grew up in Australia and had only ever been exposed to the no-bake cheesecake. The company I worked in Toronto for sent me to an educational trade show and one of the vendors was selling cookbooks. I purchased a copy of Borden’s Quick and Easy Desserts, and I haven’t stopped making baked cheesecakes since then. 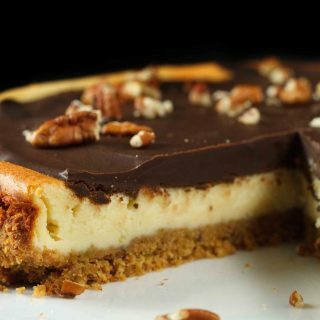 Many people think that cheesecakes are hard to make, but this couldn’t be further from the truth. If you have a springform pan and either a food processor or a stand mixer, then I guarantee that you can make a cheesecake. It is such a forgiving dessert too, because even if it cracks on top, it can easily be decorated into perfection with some whipped cream and/or fresh fruit. Another trick I have learned over time is that if you wrap the bottom of the springform pan in non-stick foil before you assemble the cheesecake, removal onto a serving plate is a breeze. All I do is slide a large spatula between the base and the crust and gently remove – even better is that you don’t even need to wash the base. I figure the less washing up I have to do after baking the better! Dulce de leche literally translates to “milk candy”. 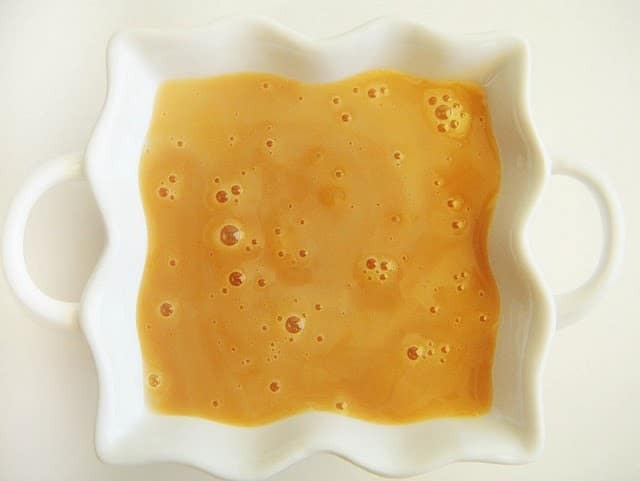 It is a delicious caramel that is made by slowly heating sweetened milk until the sugar caramelizes. It is very popular in Latin America, and is gradually gaining in popularity here. It is one of those flavors that manages to be both luxuriant and “homey” at the same time. 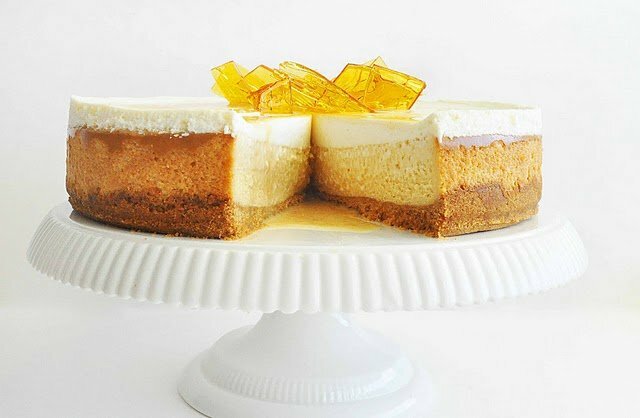 When I first saw this cheesecake recipe it was the toffee shards on top that really caught my attention. 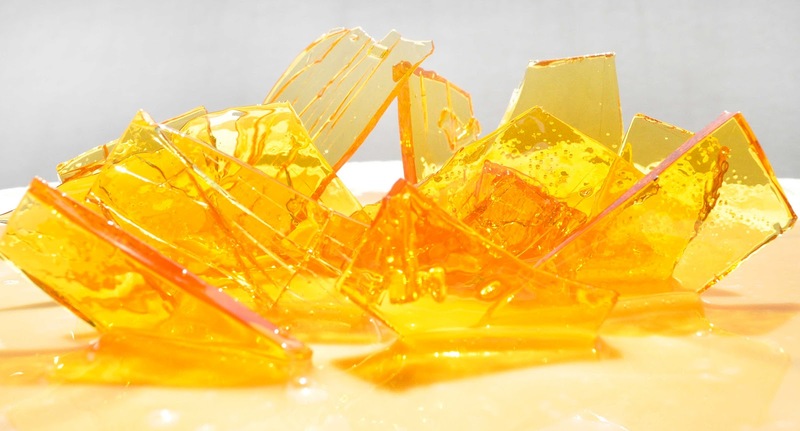 It is amazing how simple sugar and water can transform a dessert in something amazing. It is also amazing how many pieces of toffee did not last long enough to make it on top of the cheesecake, because I kept eating “just one more piece”. When making the toffee keep in mind that it can quickly go from a lovely golden color to burnt in a few minutes. Make sure you take it off the heat just as it becomes a light golden brown and quickly pour in on the cookie sheet to cool it down and stop the cooking process. This really is one of the most delicious cheesecakes I have made. Yes, there is a little prep work but it is all so worthwhile after you take one bite. 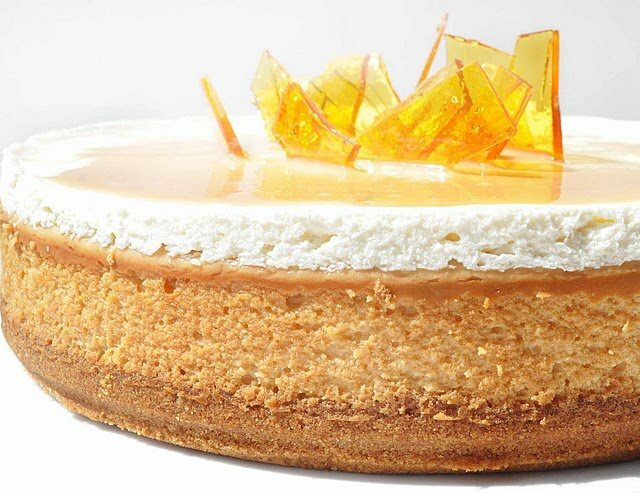 All of the components – toffee, dulce de leche, and even the cheesecake itself – can be made in advance so that you are not doing everything on one day. Then all you need to do is decorate it on the day it is required. I hope you enjoy this cheesecake as much as my family and I did, and thanks again to Chef Dennis for allowing me to come and share it on More Than A Mount Full. 1. Preheat oven to 390°F and grease a 9-inch springform pan. 2. Finely crush biscuits in a processor, then pour in melted butter and pulse to combine. 3. Press mixture into the base of the pan and bake for 8 minutes, then remove pan from the oven and reduce temperature to 325°F. 4. Meanwhile, place cream cheese in cleaned processor with cornstarch, eggs, 3.5 oz sugar and 1 tsp vanilla. Process until smooth. 5. Add one jar of dulce de leche and process until smooth and combined. 6. Pour mixture over biscuit base, then bake for 45 minutes or until set. 7. Meanwhile, place sour cream in a bowl with another 2 tablespoons sugar and 1 tsp vanilla. Beat with a wooden spoon to combine. 8. Remove cheesecake from oven and top with sour cream, then bake cake for a further 15 minutes until set. Leave in the switched-off oven with the door ajar until completely cooled, then chill overnight. 9. To make toffee shards, line a baking tray with a sheet of non-stick foil. Stir remaining 1 cup (220g) sugar and 1/4 cup (60ml) water in a pan over low heat to dissolve sugar. Increase heat to high and cook until a light golden caramel. Quickly pour onto the tray, swirling to spread toffee. Set aside to cool, then break into shards. 10. Add 2-3 tbs boiling water to the remaining dulce de leche until you have a smooth sauce consistency. When ready to serve, remove cake from pan and place on a platter. Decorate with toffee, then drizzle with the sauce. Note: Begin this recipe a day ahead. If you are unable to find cans of dulce de leche you can make your own. Be sure that you do not let the pot boil dry as the tin may overheat and can explode. Remove and discard the labels from 2 x 14 oz (396g) cans sweetened condensed milk, and use a can opener to make 2 small holes in top of each. Place in a saucepan, opened-side up, and add enough water to almost cover cans. Bring to the boil, then adjust heat to a gentle simmer. Cook for 3 hours, topping up with boiling water as needed. Cool, and then open cans and scoop out caramel. Now don’t tell me I didn’t warn you, I know each and every one of you wants to head into your kitchen right now and recreate this masterpiece Felice has given us today!! Definitely a Wow!! We are so fortunate to have so many wonderful talented bloggers in our community, every time I read a post or a comment, I truly feel blessed to be a part of this wonderful growing community of food bloggers, and every week its my privilege to bring one of them to you, to introduce you to a new friend. After all this is what its all about…..we cook, we eat, we share, with our families and our friends. Through all of lifes ups and downs, one thing remains constant……food. Now I’m not advocating that we live to eat, but since were eating anyway, we might as well enjoy what we eat!Now before you forget, please head on over to All That’s Left Are The Crumbs and say hi to Felice! Just remember to tell her Chef Dennis sent you! Have a wonderful weekend my friends, for those of you that will be celebrating Easter, please enjoy this joyous holiday, and remember why we celebrate the season. your mixing the sour cream with some sugar and vanilla, so while it will taste a little like sour cream it will be a sweeter, tastier version. 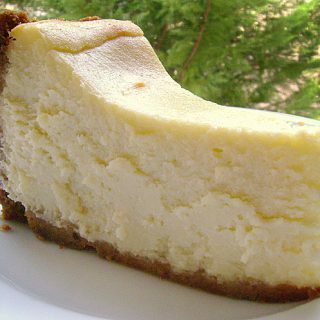 This is a topping you see frequently on cheesecakes, as it adds another dimension to the flavors, that tang against the sweetness of the cream cheese is a wonderful contrast. that being said, you can leave it off it your not sure everyone will enjoy it. Most of my cheesecakes do not have that layer of sour cream, I will use just top mine with fruit. Another great thing about the sour cream layer is that it hides any cracks if the top of your cheesecake is less than perfect. Goodness, I am drooling! More napkins to wip away my saliva. haha… Just how can I resist! Oh wow! This looks absolutely incredible! This looks gorgeous!! Happy Easter and thanks for introducing another great blog! This looks great. Love the toffee shards. What a creative garnish. I have to echo that this is one of the most beautiful cheesecakes I have ever seen. Saved! Thanks, Dennis, for sharing Felice here. And a happy Easter to you, too! This is a fabulous cheesecake. I love all of the flavors and the toffee shards. I will definitely bookmark this recipe. Beautiful guest post. Happy Easter to you, Chef! That is an absolutely incredible looking cake! wow… I love dulce de leche and I cannot wait to try this one! Thank you for sharing Felice, and thank you Chef Dennis… Happy Easter! i already follow felice's blog and i am always drooling over her recipes. 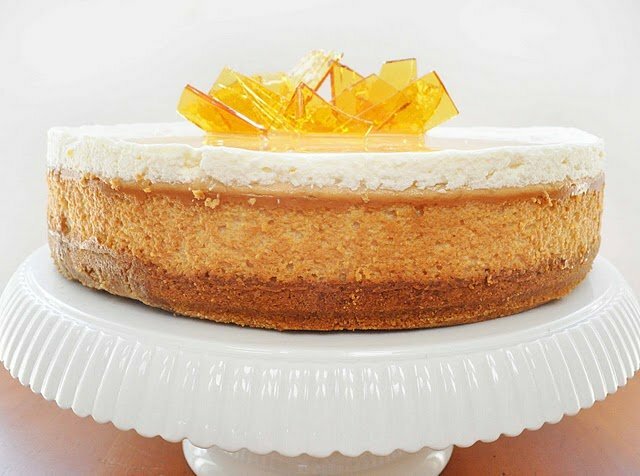 this cheesecake is no exception…it sounds delicious and i really like how it's decorated with toffee shards. so pretty! Wow, this is one serious cake. Sounds incredible, Felice. Thanks for sharing. Happy Easter. guys! wow – that cheesecake is a work of art. Dulche de Leche is deeeeelicious. Dennis – good luck with the kitchen revamp. Hope you find something that's absolutely just right. Of course, we want a blog post on the revamp with photos when you are done ! This is such a beautiful cheesecake. I was introduced to dulce de leche about ten years ago when I worked at Willims-Sonoma. Ever since then it has been one of my favorites. Thank you Felice for this recipe and thanks Chef Dennis for this great guest post. I am going to dream about this cheesecake… I'm speechless… and my mouth is watering! Beautiful job, Felice!! Thank you chef, and Felice for sharing this deliciousness with us! So beautiful! Everyone must be in a cheesecake mood because I keep seeing them pop up! I saw the first picture and I almost fainted! 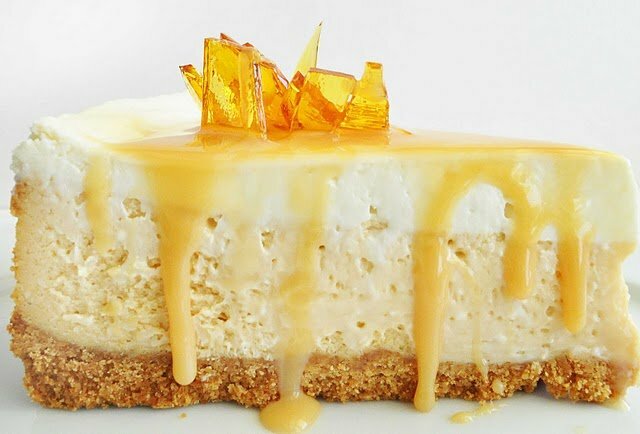 These cheesecake is just so beautiful and dulce de leche ehmmm one of my favorite flavors so I know for sure it was delicious too! I've admired Felice's work and am so glad to see her up close and personal here! Thank you Chef Dennis! I think perhaps she should change her name to Nothing Left Even Crumbs though after reading and seeing this! That is one of the most gorgeous cheesecakes I've ever seen! I'll definitely be bookmarking this one! Chef Dennis! Im blaming you for the rain, cold wind, and un-spring like weather that we've been getting for the past few days only a short hop away from you. This cheesecake just may make up for it though. Look at that! I love Felice's posts! a dulce de leche cheesecake! mmmmm wow! it looks amazing. just when i think i know what to make next! it's just lovely. good luck with your remodel dennis! Wow! What a cheesecake! Thank you, Chef, for such a fantastic guest post and best of luck with the home renovations! Chef, you never disappoint! 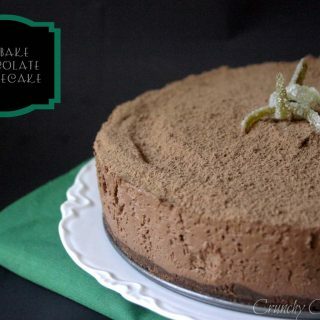 Thanks for sharing yet another great blogger in Felice and this ridiculously delicious cheesecake! Felice, we just recently discovered All That's Left Are the Crumbs and cant' tell you how much we've enjoyed out mouthwatering journey through your recipes. Great post(s, both of you! wow this is so beautiful!!! I like the color and presentation. I can tell from ingredients that this must gotta be good! Dennis,wow I have no idea good stove costs more than buying a car! Good luck with the makeover. Happy Easter!! 🙂 If I was one of those stove manufactures I'd totally give you one in exchange for an add. I'll keep my fingers crossed for you 😉 That recipe looks amazing. Magazine worthy. Enjoy your weekend! Absolutely brilliant. This is a stunning, jaw dropping cheesecake that I cannot wait to give a go. Love this guest post! This cheesecake looks amazing! The shards of toffee are to die for. I need to find an excuse to make this ASAP! I can barely speak! Literally picking myself up off the floor! Seriously those shards are breathtaking!! I have yet to master the cheesecake to my liking…but I will keep trying! Thanks for this post Dennis. And Felice – you are one talented lady!! Dennis, I'm so happy that spring is finally there for you! How I love tulips, and they just don't do very well here in San Diego without the chill. I gave up on them and now buy them at Trader Joe's when they are in season. A wonderful choice you made to reach out to Felice, your comments about her hit exactly, and, I'll brag just a little bit here… I actually met her!!! Yep, last fall when my husband and I traveled to Hawaii Felice and I had a most enjoyable evening at Roy's in Waikiki. It took about 90 seconds after meeting her to feel like I had been a friend for years. She is truly one of the nicest, most welcoming people I've met and I'm working on my husband for a return trip! I believe there is another restaurant we must try! Felice, simply stunning, stunning photos!! And that cheesecake, wow. I, too, love the shards on the top, but then I'm a huge toffee lover as well. Loved your analogy to the first dance, I know what you mean!! A beautiful post, Felice and Dennis! A wish of safe travels to Felice and warm spring breezes for Dennis. Oh, and also for Dennis a call from Wolf is on my wish list for you!!! Oh my, oh my, oh my. I'm swooning. 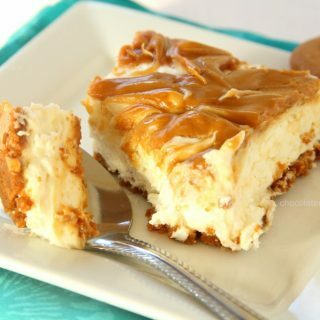 This hits heavily at two sweets I love; caramel and cheesecake. I'm in heaven, serious heaven. Felice, thank you, thank you, thank you. I even called Hubby over to look at those picture. It's an amazing creating you've shared with us. Beautiful guest post! Thanks for sharing such an amazing recipe. It looks so fancy! I would have been drooling over these pics all week too, lovely guest post. Happy Easter. Felice, that is just SO gorgeous…it is screaming Spring to me. I love the pictures, they are so bright and welcoming. It looks delicious! Oh WOW Felice, that looks AMAZING!! Wow that cheesecake looks delicious! and so beautiful!! I meant to add: No sunny warmth here yet. Please send it our way! Well, you were right. Gotta go get something to eat now! 🙂 What a beautiful cheesecake and a great recipe. That is such a gorgeous cheesecake! EEEK! I am making a cheesecake tomorrow and am so excited that you posted this because I couldn't decide how I wanted to top it. Now I know. These photos are absolutely stunning. Thank you for sharing! I just licked the screen. I did… and I'm not ashamed to say it. Couldn't help myself. mmmm…cheesecake happy place! No dout Felice will be seeing lots of hits from me as I scour through her archives to find the perfect dessert for my husbands birthday in a month. Hi Felice. The cheesecake looks superb! And no doubt it tastes wonderful. The toffee shards look beautiful too. Felice! I agree with Chef Dennis's sentiments entirely-your blog and recipes are nothing but lovely and this cake is stunning. Great post! Chef-thanks for spotlighting such a great recipe and good luck on the remodel! Chef, how exciting about the remodelling albeit that you are having a bit of a time with it now – it will be all worth it in the end. Felice what a remarkable cheese cake – you have just sold me on a baked version. After you get done with remodeling… I hope you share some pics with us. The cake is mouth watering. Felice, this cheesecake is so beautiful to look at, I can't take my eyes off of those shards of toffee!!! It looks so light and fluffy…..fabulous job! Is it just me or the photos not showing up for others? i would agree all that would be left of that cheesecake would be crumbs. Great job Felice. Good luck with the remodel. It might be crazy with your remodel, Dennis, but think how nice your kitchen will be when it's done! Thanks for introducing us to Felice – I think that is the most beautiful cheesecake I've ever seen! Fantastic! I'll have to check out her blog.